i love simple and minimal projects so i couldn't resist putting together a round up of some i've come across recently! we started some renovations on our house which is super exciting but i 100% underestimated how long they were going to take, dang. i think we're finally making good progress tho (we almost have a functioning bathroom again) so i'm hoping to be working on some new content again soon, hurrah. in the meantime why don't you go check out these snazzy DIY's.. hope you find them inspiring! - wire wall organiser DIY project. - DIY mirror and hook by mydubio. - DIY clock by passion shake. 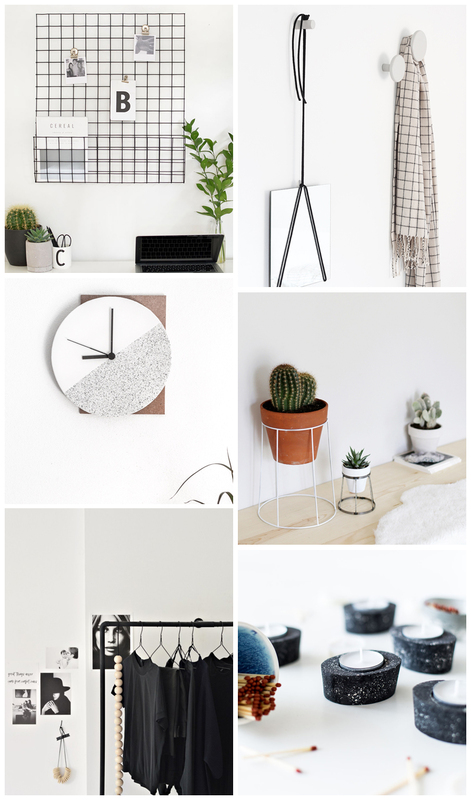 - wire plant stand DIY by the merrythought. - minimal open wardrobe by your DIY family. - speckled concrete candle holders by fall for DIY. The open wardrobe is so cool, I would love to try that!